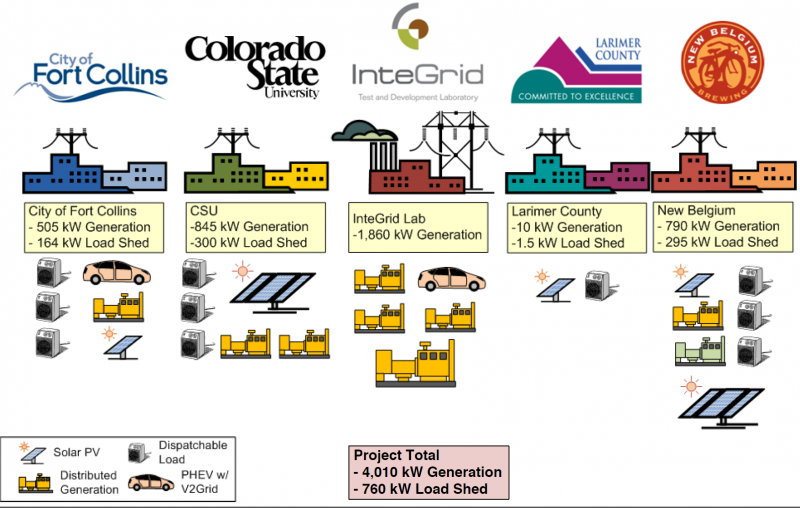 The Fort Collins Microgrid in Colorado is part of a larger project known as the Fort Collins Zero Energy District (FortZED), where the district plans to create as much thermal and electrical energy locally as it uses. The main goals are to develop and demonstrate a coordinated and integrated system of mixed distributed resources for the City of Fort Collins, reduce peak loads by 20%-30% on two distribution feeders, increase the penetration of renewables, and deliver improved efficiency and reliability to the grid and resource asset owners. The microgrid project involves multiple customers including the New Belgium Brewery, InteGrid laboratory, City of Fort Collins facilities, Larimer County facilities, and Colorado State University main campus facilities as well as a variety of distributed energy generation technologies. It has received $6.3 million in funding from the U.S. Department of Energy and $4.7 million from the various industry partners, including Eaton, Advanced Energy, and Brendle. Technologies in the project include solar PV, CHP, microturbines, fuel cells, plug-in hybrid electric vehicles, thermal storage, load shedding, and demand side management. The combined distributed generation and load shedding capabilities is 5 MW spread across five customer locations. The larger FortZED project represents about 10-15% of Fort Collins Utilities’ entire distribution system, with a peak load of 45.6 MW across 7,257 customers. There will be a total of 345 kW of solar PV, as well as 700 kW of combined heat and power, 60 kW of microturbines, and 5 kW of fuel cells. The brewery in particular can produce over half of the power it consumes, when its own distributed generation facilities (790 kW biogas power, 200 kW solar PV) are running at peak power. Additionally, the various facilities have diesel-based backup generators totaling 2,720 kW in capacity, which are typically used for emergency power. Demand response will occur through various heating, cooling, and ventilation rescheduling using existing Johnson Controls and Trane building automation systems. Overall, the project is considered to be very innovative for a small municipally-owned utility and will offer interesting lessons for other milligrids under development.